This is a brand-new arrival from Brazil … and imagine my surprise when I discovered a whole new starbrary! 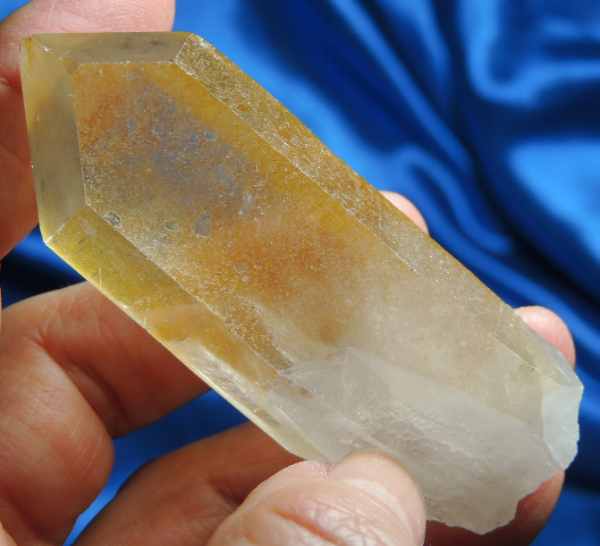 This is a 2 oz, 2.9” by 1.1” by 0.8” amazing golden quartz wand with keys around all but one side of her base. She has a somewhat skewed termination and the faces are subtly glyphed and bear a number of record keepers … a loupe will help you see them as they are faint. Interestingly, there is a tiny, tiny window and a raiser termination at the edge of one face … she is a very subtle Dauphine twin! The sides are covered with starbrary glyphs. Most all of the starbraries only have glyphs on every other side … the Libra has glyphs on all sides (although some sides more than others) and even in bas relief in the keys! The glyphs are varied and yet sweeping … somewhat like a Cassiopeia but much more detailed and intricate. Her color is a rich gold, leaning just a hair towards orange. She is simply extraordinary and her messages are awaiting her special Keeper! There are some tiny dings along the facial edges but nothing of significance.